Arduino provides a framework for building projects that control electronics. It's very popular with electronics hobbyists and professionals. Arduino development is a very useful skill for young makers to master. The Arduino Starter Kit is a projects book plus Arduino microcontroller and electronics. There's also a series of video tutorials that accompany the kit. The Arduino Starter Kit includes an Arduino Uno development board mounted on a base along with a breadboard. This makes it easier to connect projects up as it stops the breadboard sliding away from the development board as you work. You also get lots of individual components including a dc motor, a servo, LCD display, LEDs, sensors and lots of resistors. This is proper electronics. You don't need to solder, but you will be connecting up electronics components and it's quite possible to get things wrong and damage components. You also get some cardboard parts that are needed for some of the projects. 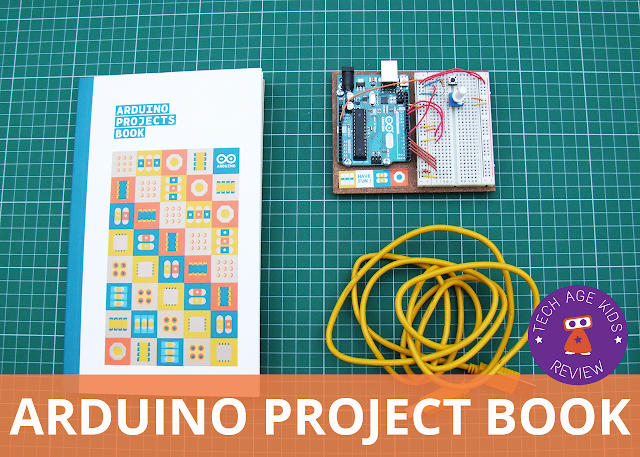 The Arduino Projects Book is part of the kit. It includes introductory material and 14 projects to work through. The projects have a fun feeling to them and include a Light Theramin and a Motorized Pinball. The instructions are very wordy and the diagrams have lots of written notes to help you understand what's going on. The book is bound with string and does a good job of staying open on a table while you are working on projects. 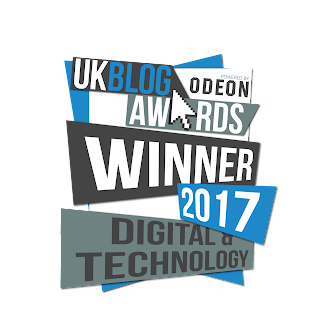 But, the font used is very smaller and an even smaller font is used in many places. This made it impossible to quickly scan for instructions while trying out a project. Young eyes will do better, I guess. 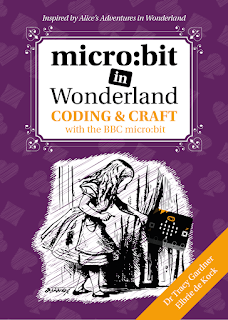 If instead of buying the Arduino Starter Kit you choose the Arduino Basic Kit then you won't get the book but you'll get access to the project guides online at Autodesk Project Ignite. The Spaceship Interface project is currently available for free to try before you buy. The Project Ignite content uses the 123D Circuit tool to allow you to create digital simulations of the projects. It also includes clear images and instructions for creating the projects with the physical hardware, which is probably what you want to do. There's a series of videos to accompany the Starter Kit presented by Arduino co-founder Massimo Banzi. These are well presented and include lots of general information on electronics and Arduino, not just step-by-step instructions for the projects. 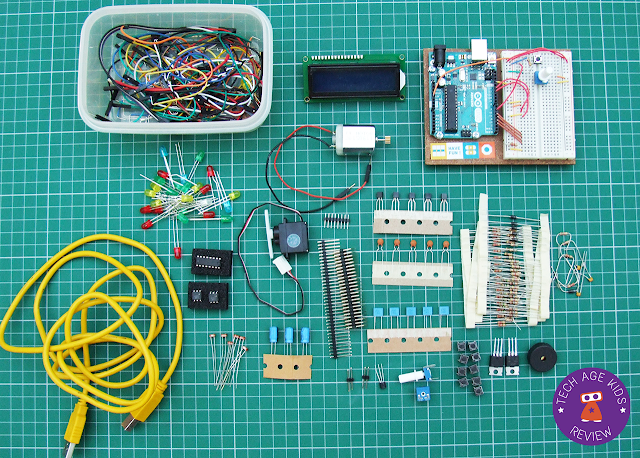 With electronics kits we always worry about how we're going to keep track of the components. The Arduino Starter Kit just comes in a cardboard box which isn't very useful as long term storage. 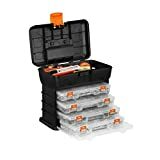 We'd recommend that you get a plastic toolbox with compartments to organise the kit. It would be nice to have something that you can store the book in to keep it all up together. It's going to be really annoying if a teenager does a few projects and then loses track of the components before they return to the kit. Some teenagers are organised, some not so much! The Arduino Starter Kit or Basic Kit is a complete starter package for learning Arduino. It's a good choice for older teenagers who are happy to dive in and learn about electronics and microprocessor control. 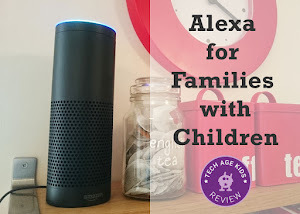 It would also work for techie families where the parents want to pick up some current skills for their family maker projects. 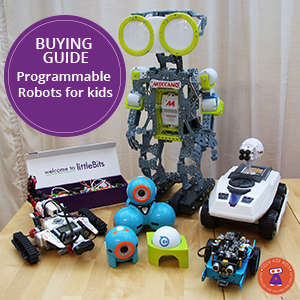 The kit could be overwhelming for beginner families and teens. If you want a gentler introduction then take a look at the DuinoKit Jr which removes a further layer of complexity in a neat package where you won't need to worry about losing bits. Or try out the DIY Gamer Kit from Technology Will Save Us which allows families to assemble an Arduino-based games console and develop games for it. 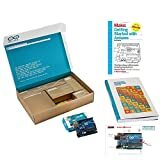 Consider whether it makes more sense for you to choose the Arduino Basic Kit with online material at Project Ignite or the original Arduino Starter Kit version with the physical book.